Yesterday a vet came rushing in to our offices in dirty wellies and mud-splattered shirt just in time for his job interview. The sidelong glance from our office-based colleague with his crisp white shirt and perfectly pressed trousers didn’t go unnoticed. 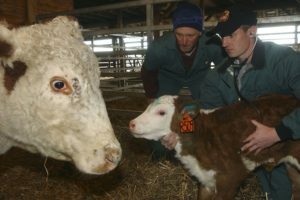 The vet explained that he had just returned from a breach birth emergency callout on a nearby cattle farm and had to make a choice of being late for our appointment or turning up in his working gear. This kicked off a bit of a debate in our offices afterwards. Some were adamant that he should have gone home to change to make a good first impression. Others admired his confidence and commitment to turn up on time, sans clean attire. As a veterinary professional – how should do you dress for a job interview? Is it more appropriate for a nurse to wear a uniform or to show individuality and arrive suited and booted? Should you tie up your hair or is it acceptable to leave it long and flowing? How about painted nails and jewellery, or tattoos and face piercings? Do you take a chance and hope the prospective employer accepts you as you are, or do you deliberately cover up, pare it back? What if the person you are meeting has preconceived ideas and prejudices? Would that jeopardise your chances? An accountant friend recently went for an interview at a small home-based laboratory and pondered beforehand about what to wear, knowing the environment is casual. In the end he dressed in a suit and tie, wanting to appear ‘professional’, yet he admits he was completely overdressed and out of place compared to the interviewers who all sported jeans and tees. But would they have judged his attire as inappropriate or disrespectful if he arrived wearing casual clothes? When is smart too smart and casual too casual? Our debate continues. The vet…well, he got that job and is no doubt doing a splendid job kneeling in a dusty, hay-filled barn as we speak. 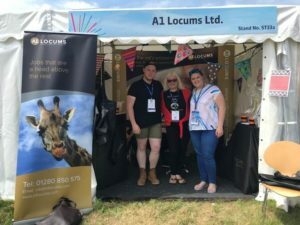 Thank you for visiting A1 Locums at VET Festival! 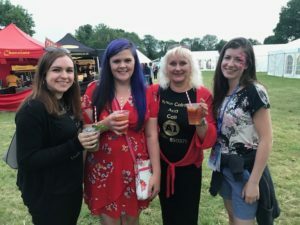 We look back on a fantastic couple of days at the annual VET Festival event which took place on 8 and 9 June 2018. Anyone who exhibits at an event knows it takes months of planning and weeks of anticipation before you even arrive at the venue. In the run-up top the event we hosted a facebook competition to give away free tickets to the event, and were delighted with the response. At VET Festival we organised a free prize draw to give away a ‘cat’ hamper and ‘dog hamper’ to two lucky winners who registered with us. Having launched our new A1 Locums App earlier this year, we also offered a free reusable coffee cup to any stand visitors who showed us the app on their phones! 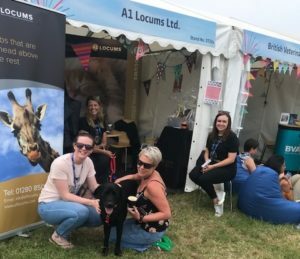 We asked Sophie Vickers, Senior Recruitment Consultant at A1 Locums for her impressions of this year’s VET Festival. “Vet Festival is one of our favourite conferences. Relaxing atmosphere, great CPD and fantastic company along with a side of live music and a glass of bubbly. We met a lot of clients who have gone on to pastures new, clients we have been working with for years and the future generations studying at university. “The industry is fast paced and still growing, attracting speakers from all over the world.. Our little Wilbur met all the nurses that looked after him at Fitzpatricks. He greeted every one with a wag and a cuddle, and was most definitely the star of the show! Sadly, it’s time to pack away the marquees and bales of hay for another year, but we will be back for 2019 on stand ST35a .. come and meet us there. When our REC Compliance Test certificate dropped through our letterbox, it was real cause for celebration at A1 Locums. Why, you may ask, is this recognition such a big deal? When you’ve been running a veterinary recruitment company for almost 20 years and have seen the industry change massively over time, it’s a proud moment to know you are riding the crest of the wave; you are right there where all the action is; you are neck and neck with the front runners in recruitment. Having achieved 97% in the Test is a firm acknowledgement that your company demonstrates an understanding of the REC’s Code of Professional Practice. It’s a significant statement that says A1 Locums really does meet the requirements for the Conduct of Employment Agencies and Employment Businesses Regulations. This ethos is embedded in the way we do business. I’m thinking back to how we operated when I started in recruitment: telephone calls, personal meetings, faxes and posted letters were the order of the day. Social media was not even a twinkle in the eye of the Mark Zuckerbergs of the world. Compared to how candidates searched for jobs way back then – today, with the swipe of an app or a quick search phrase, candidate and employer can be linked in a flash, without a human conversation necessarily having taken place. Communication is fully mobile and instantly accessible anywhere, any time of day. But what lies behind the achievement of this certificate? Let me take you on a trip to a picturesque setting, to a farm in the Northamptonshire countryside, to a barn nestling among stables, sweeping fields and ancient woodlands; the offices and people that make up A1 Locums. 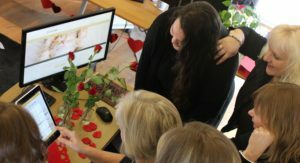 We are not only veterinary recruiters; we also truly adore animals! Ring the doorbell and Wilbur the dog and TC the cat will be the first to investigate your arrival. Step inside and it’s a hive of friendly activity, where we do what we do best; matching top candidates to the best veterinary jobs. 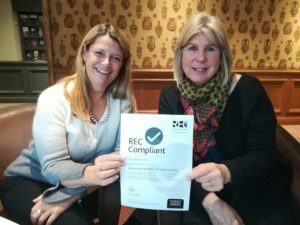 The REC has established that we have the tools needed to be a compliant and efficient recruitment business, but more importantly, we have people you can pick up the phone to, people who are not hidden behind faceless digital platforms, but real people who are interested in your next move as a locum vet or nurse. I am proud to say that my team is immensely dedicated; they’re professional, skilled and experienced. We are fortunate enough to have built up great relationships with practices around the country over the years, and those practices know that at the drop of the proverbial hat, they can call us to find them a suitable candidate. Candidates, in turn, have come to trust that we will match them to the right practice and keep them informed about the latest locum jobs. "To Anne and A1 Locums, Thank you very much for helping me to get work the last 4 years and for looking after me. I wouldn't be as successful as I am now without you all. Keep inspiring young woman like me to locum it's the best thing I did and thank you for coming to Harper Adams and encouraging me to come and work with yourselves."